If you travel around the country, you’ll be finding signs like this posted near lakes and rivers all over. I’ve been studying Chemistry all night and I came across this in the textbook. In the last decade, the U.S. Environmental Protection Agency (EPA) has grown increasingly concerned about mercury levels in fish. Mercury — which is present in fish as methylmercury — affects the central nervous system, especially in children and developing fetuses. In a developing fetus, excessive mercury exposure can result in slowed mental development and even retardation. Some lakes now have warnings about eating to much fish caught in the lake. Recent regulations have forced many fish vendors to alert customers about the dangers of eating too much of certain kinds of commercial fish, including shark, tuna, and mackerel. These fish tend to contain high levels of methylmercury and therefore should be eaten in moderation, especially by children and pregnant women. 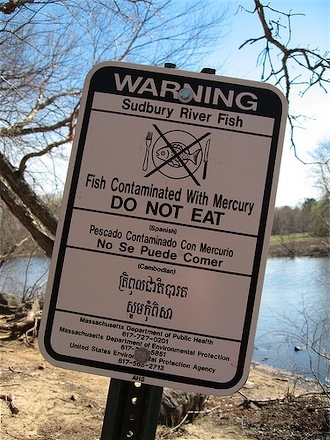 The U.S. Food and Drug Administration (FDA) action level — the level below which the FDA claims the food has no adverse health effects — for methylmercury in fish is 1.0 ppm or 1.0 g of methylmercury per million grams of fish. However, a number of environmental advocacy groups, including the U.S. EPA, have suggest that, while this level may be safe for adults, it is too high for children and pregnant women. Consequently, the FDA suggests that pregnant women limit their intake of fish to 12 ounces per week. This sort of thing really depresses me.